If you are still using Outlook and catch that occasional sneer from the ‘cool kids’ using Gmail or ThunderBird? Or are you forced to use it at work for some other reason? No worries. Xobni can make you look cool using Outlook. Xobni is just the reverse of the word ‘inbox’. And it is an Outlook plugin that saves you time finding email, contacts and file attachments. On installation, you will see a Xobni toolbar which will make finding stuff in your Outlook much easier. Xobni extracts information from emails and presents in a easy to read format in the sidebar. Check out this page to see a video demo and learn more about Xobni. Xobni just raised a $7 million series B round of funding led by Cisco. In a market like this, it goes without saying that they have a solid product in hand. I don’t use Outlook anymore but I have done so in a previous work place. So when I read about Xobni, I immediately wished I had known about it then. So I just wanted to share it with you here. Let me know if you try it and how you liked Xobni. I’m one of those poor saps forced to use Outlook at work! Not only that but I have to support it. I’m going to try this out & let you know how it goes. I don’t use outlook either but I wish I did with all these features. I wonder if they will be working on add ons for other programs? Hey buddy, I knew there’s gotta be someone who’ll find this useful! 🙂 Let me know how it works for you. I have been using Xobni for nearly 3 weeks and I use it everyday. I am also having other people in my office beta test it, then am going to send it out to all users in the company. It makes searching Outlook soooooooo much easier, faster, & just plain better. I must mention also that I manage an IT department for a mid-sized wireless company in East Lansing, MI. I give the app 2 big thumbs up. I didn’t even realize Xonbi was the reverse of ‘inbox’. Clever! 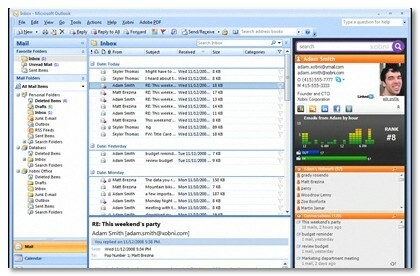 I’m using Outlook Track-It right now. It downloads a small toolbar that increases functionality. One of the cool things it does is sets followup reminders. Not too shabby. Xobni aint bad! I use Outlook Track-It, lately. It’s also a plugin program for outlook but it lets you flag emails for followup reminders. I’m here to chime in again on my testing of Xobni. I’m happy to say that the president of my company tagged it as one of the best tools he has ever installed! He loves it for the nearly instantaneous searches, the social networking interface, and the fact that it finds & displays attachments from all emails. He uses it every day and loves it. He wants me to put it on everyone computers here at work to improve their efficiency. Personally, I love it too & use it daily. Great review K.
Matt, thanks for posting back your experiences! It should be really helpful for anyone considering to use it in their business.